The railroad timetable was, in its way, an art form, as well as a succinct way to communicate important information to those who operated and rode the trains. The timetable contained absolutely correct and legible maps, distances, elevations, and geographic information. It also contained the specifications of the trains, the types of passenger cars on them and their routing. Union Pacific ran a complicated network of passenger trains on its Overland Route, and in its heyday the system worked with efficiency and style. We show Union Pacific timetables of several vintages in this book, because they were such elegant forms of written communication. Former grade of the Utah & Northern Railway in Marsh Creek south of Inkom. The narrow-gauge rails ran parallel with Marsh Creek road, between the road and the creek, on the right hand (west) side of the view. The railroad grade can also be seen in the center of the Marsh Creek Valley heading to the upper right. Dry waterfalls or alcoves can be seen on the Basalt of Portneuf Valley above the right of way. Here the Lake Bonneville Flood filled the valley and poured over into Marsh Creek. Interstate 15 is on the left. 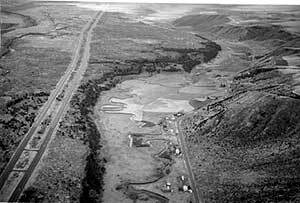 Meandering Marsh Creek was prone to flooding, which caused the railroad right of way to be relocated in 1882 with building of the Oregon Short Line along the east side of the valley, along the Portneuf River, (July, 1990). The Fort Hall Indian Reservation had been created by presidential proclamation as a result of the Fort Bridger Treaty of 1868. The Treaty required that any roads constructed through the Reservation must be approved by a majority vote of the adult males of the Tribes involved, after payment to the Indians of just compensation. In 1878, the rejuvenated narrow-gauge railroad, now named the Utah & Northern Railway Company, solved this problem by ignoring it, and began building north. Its route left the Bear River terminal north of Preston, crossed the River, and went up Battle Creek itself to a station about one mile east of Oxford, Idaho, then to Red Rock Pass and down Marsh Creek to the Inkom area, crossing the Portneuf River at Blackrock on a bridge that is still used. After passing through the Portneuf Gap, the tracks skirted the southwest side of the basalt lava flow of Portneuf Valley, and ran across what was to become the campus of Idaho State University to Pocatello Creek, and then north to the Ross Fork Agency and the Blackfoot River, the northern boundary of the Reservation. The trespass and failure to comply with the Treaty created tension between the parties and although the Bureau of Indian Affairs demanded compliance by the Railway Company, nothing was done about it. At one time in 1878, word came from the Ross Fork Agency (Fort Hall) that the Indians would accept 500 head of good cattle for letting the rails cross the Reservation but no official response was made to this offer and little was heard about it again. The official position of the Railway Company's management was that the Congressional authorization for the road to build to Montana was granted after the Reservation was established, yet no mention of the Reservation appeared in the act of Congress; therefore, by implied revocation, Congress had relieved the Company of any obligation under the Treaty. There is no indication in the records that the Company seriously believed in this totally specious argument, but it made no attempt to patch things up with the Indians or the Bureau and the dispute festered for ten years until the Act of September 1, 1888, was passed, ratifying the treaty of May 27, 1887. The Idaho headquarters of U & N was established at Eagle Rock (Idaho Falls) and by 1880 the tracks had been extended up Beaver Canyon to the Continental Divide at Monida Pass. By December, 1881 service was instituted to Butte, Montana. Garrison, Montana was reached in 1882 but this portion of the right of way was later leased to Northern Pacific.